In celebration of National Library Week this week’s Thursday Thirteen is all about Librarians. I bring you a list of folks both real and fictional that are, or have been, librarians. I think that some of the names will surprise you. Have a great week, and be sure to support your local library. 1. Benjamin Franklin (1706-1790) – Franklin was a man of many talents and accomplishments. No only is he one of the “Founding Fathers” of the USA, he is also credited with founding the first American Library (a private subscription library called the Library Company of Philadelphia.) He served as librarian for a brief period of time. 3. Giacomo Casanova (1725 – 1798 ) – Most famous for his romantic escapades, Casanova spent the last thirteen years of his life as the Count of Waldstein’s librarian in the Count’s château at Dux. Though this position was not ideal, at least it gave him time to work on his famous memoirs. 4. David Hume (1711-1776) – Scottish historian and philosopher Hume was appointed librarian for the Advocates’ Library at the age of 43. 5. Batgirl (sadly, fictional) – Barbara Gordon, head librarian of the Gotham City Library and daughter of the police commissioner, is also secretly Batgirl, fighter of crime. 7. Nancy Pearl (1945- ) – Librarian, author, and action figure model, Pearl is perhaps the most famous living librarian in the United States at this point. She has now retired from the Washington Center for the Book, but that just means that she has more time to read…and recommend. 8. Beverly Cleary (1916- ) – Being a children’s librarian inspired Cleary to fulfill her childhood dream of finding books about kids “like her”…by writing them herself! 9. Pope Pius XI (1857-1939) – Born Ambrogio Damiano Achille Ratti, this future pope went from being the chief librarian at the Milan seminary to becoming vice prefect of the Vatican Library. He even developed his own classification system. 10. Laura Bush (1946- ) – Before marrying a fellow named George, Laura worked at the Houston Public Library and was the librarian at Austin’s Dawson Elementary School. 11. Golda Meir (1898-1978 ) – Before becoming Prime Minister of Israel, Meir once worked as a Librarian in both Milwaukee and Chicago. 12. J. Edgar Hoover (1895-1972) – Before becoming head of the FBI, Hoover worked as a cataloger for the Library of Congress. Apparently he was very interested in information. This was very interesting! I didn’t know that Mao Tse Tung, David Hume, and many others on your list were librarians at one point. J. Edgar Hoover! I about fell off my chair laughing! My 13 movie still is shared for T-13 this week. Come by if you can. This was a great read! I was surprised to see Mao on the lists. I guess I don’t expect dictators to be among people I respect so much. One of my favorite librarians is Madeleine L’Engle, who was librarian at St. John the Divine Cathedral in New York City. Wow, who knew? Cassanova? Never would have guessed. Happy T13! Hi Irishcoda! I’m glad that you enjoyed the list. The librarian thing explained so much to me about Hoover. Hootin’ Anni, well, now you’ve learned your new thing for the day. Feel virtuous. Sandy, that she was. She was also writer in residence for Victoria magazine at one point. marcia, I couldn’t leave out batgirl and Giles. Adelle, if only Don Juan were a librarian we could call it a trend. Sigh. I’ve worked in a library too and almost switched majors to Library Sciences. Happy TT. Thanks for stopping by. Once upon a time I was a librarian wannabe, so this was quite a fascinating list. Thanks for posting it! Bethanie, I’m glad you enjoyed my list. Happy National Library Week. My personal favorite (also, sadly fictional) is Katherine Hepburn as librarian Bunny Watson in the movie “Desk Set”. A great movie to watch during the holiday season, with plenty of chilled champagne at hand! I knew about Casanova and Hoover but not about Mao and Hume. Great list! We have Barbara Gordon cards in our game! jennifer, thanks for the movie recommendation! Rian, obviously your game has style. Another pope who worked before as librarian of Cosimo de’ Medici was Nicholas V, family name Tommaso Parentucelli (1397-1455). wanted to be appointed Vatican librarian 13 years ago when he was seventy, but pope John Paul II did not approve as the present librarian and archivist cardinal Raffaele Farina reported recently. The is a great fictional librarian in the children’s novel The Legend of Spud Murphy by Eoin Colfer. Marjorie Cotton Isherwood, best known by the name Marjorie Cotton (1913–2003), was the first professionally qualified children’s librarian in New South Wales, Australia. She initiated programs that are the basis of services to children in Australian public libraries today. Phillipena (Ena) Noël, AOM (30 July 1910 to 7 December 2003) best known by the name Ena Noël, was an inspirational school teacher and advocate for children’s literature and library services to children and young adults. Ena Noël’s name is synonymous in Australia with children’s literature and with IBBY, the International Board on Books for Young People. In Australia, she is still affectionately known as ‘Mrs IBBY’. on Sunday, July 31, 2011 at 2:15 pm | Reply How to Make “Librarian” the Coolest Gig on the Planet | meg was here. 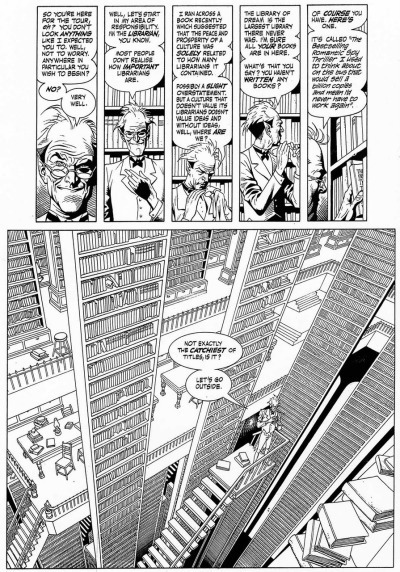 This list wouldn’t be complete without the ultimate fictional librarian, Lucien from the Sandman comics. His realm is the library of dreams, containing every book never written, as well every version of the ones that were. When he loses his realm for a few decades, you can feel the loss in his eyes. Read the Sandman, still on of the most amazing literary achievements in the history of stories in general. BONUS: Alice, the ghost librarian from Ghostbusters.